Polynomial division depends on the number of terms in the denominator (divisor). If the the denominator is a monomial, then the process if pretty simple. If the denominator is a binomial (or larger) then the process becomes a little more complicated. This page will show you how to perform long division. 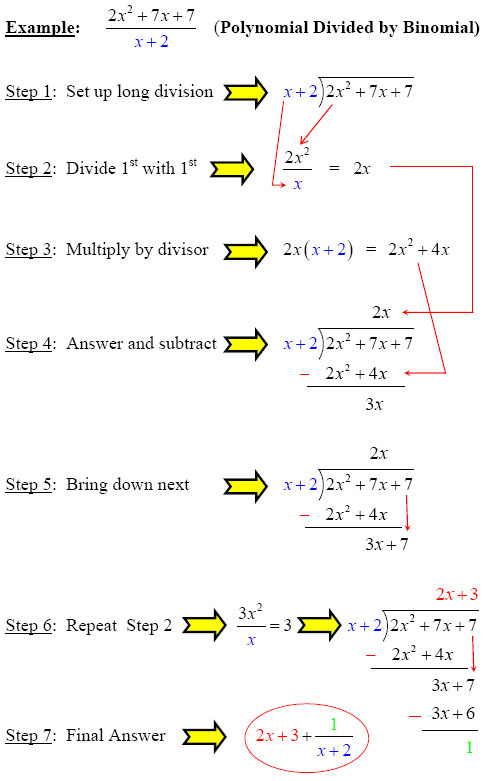 However, most students find synthetic division to be must easier, so you might want to take a look at that as well. Either process will give you the same answer. If you need a refresher, take a look at naming polynomials. You can think of this problem as a war between the top and the bottom. Check out the example below to see what we mean. Note: you can probably do the "war" in your head for all of the letters. Essentially you are subtracting the top exponent from the bottom exponent for each individual variable. 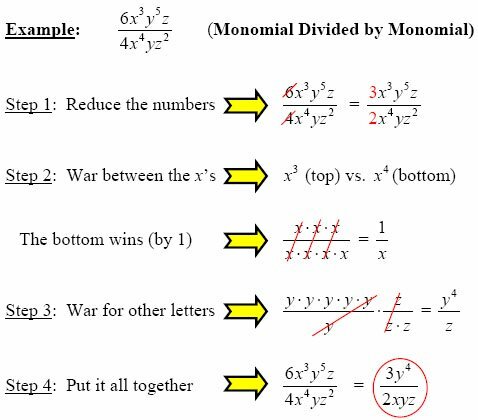 Now that you know how to divide a monomial by a monomial, you can divide any polynomial by a monomial. All you have to do is break it up into seperate problems. Notice the three colored circles below - each one becomes it own division problem like we did above. Now you are ready to really learn polynomial division. This process is more difficult than the previous, but you can handle it - with some GradeA help of course. When you divide a polynomial by a binomial you are basically performing long division. Do you remember that from elementary school? Take a look at the example below. Sorry there are so many steps! Notice that the final answer is written as quotient + remainder/divisor. In some cases there will be no remaineder, but more often you will have one. After all of that, I bet you are asking yourself, "Is there a faster way to do this?" In fact, there is! It is known as synthetic division, and many students find it to be much easier. You might want to check it out for a faster way to perform polynomial division. Return to more free algebra help or visior visit the GradeA homepage. You may also want to learn how to multiply polynomials. Especially to multiply a binomial times binomial using the math FOIL system. 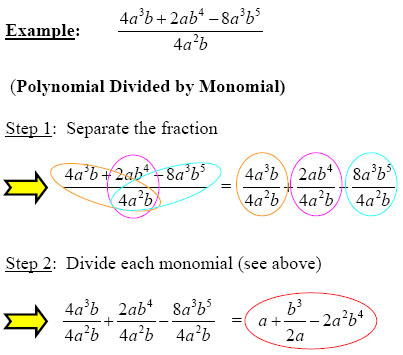 GradeA also can teach you how to factor polynomials!